Victoria Ice produces the very best range of packaged ice for the Victorian Ice market, with the newest and largest ice production facilities in Australia and the latest ice manufacturing equipment.We can supply ice merchandising equipment to your business at no charge to you from which to retail our packaged ice. We have onsite storage for 600 tons of premium packaged Ice. Our Bag size is the 5kg bag. 5kg is by far the most popular size in Australia with 80% of retail ice sold in Victoria being the 5kg bags. 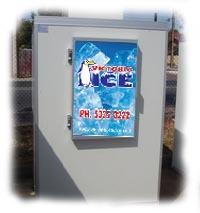 We can supply the most modern and up to date Australian made ice cabinets to your site. These are supplied at no charge and are serviced regularly by Victoria Ice, again at no charge to the customer. If service matters to you then we are only a telephone call away.